Rich verdant hills tower over the river valley below. Mine workings perch on rocky outcrops as tired railway lines sneak their way up through tunnels and inclines to carry ore away and deliver coal and raw materials to the ever hungry beam engines pumping water up from deep workings where miners toil. 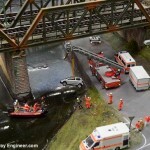 That’s the scene I ‘m currently creating on the section of my N scale layout I’m building at the moment. I’ve covered the river, that carries ore away, previously. This weekend I’ve been working on the hills and cuttings. 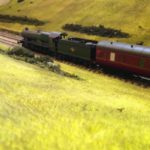 My preferred method for making hills is with thick Polystyrene sheets, stacked to appropriate height and glued in place with trusty PVA. The hills are then sculpted with a electric hot knife blade (make sure you have the windows open, the fumes are nasty!) and carved with a scalpel for fine detail. Inclines, both exposed and in tunnels, are calculated and then slowly carved, continually checking the angle as I go to make sure they’re not to steep or too slight to make the final destination height (see calculating inclines). 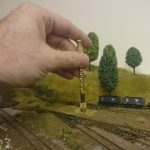 I have used Woodland Scenics inclines previously but now prefer to make my own. It’s cheaper and once you’ve worked out the gradients no much harder. Peco Flexitrack is then positioned but not glued down to check I haven’t breached the loading gauge limits (the clearance either side and above the rolling stock) and locos can navigate the incline. I use the edges of the Polystyrene sheets to provide straight and square tunnel gateways. The edges will provide a flat surface to which the tunnel portals that will be added later can be secured. More Polystyrene is then cut and carved to close-in the tunnels and provide more height to the hills. These top layers are cut but not permanently glued, yet. Once I’m happy with the overall hill formation it’s all covered in Modroc to give a smooth surface onto which vegetation can be applied later. One tip for anyone using Modroc: occasionally you can be left with gaps between the weave of the bandage where the plaster doesn’t fill the holes correctly. For these instances either another layer of Modroc can be applied or PVA can be spread over it once it’s dried. Both will cover the gaps. With the Modroc in place and set, the track is the laid and glued down with PVA. When fixing track to baseboards, you can use pins or even screws to hold it firm while the PVA sets. On Polystyrene however this obviously won’t work. Instead I use a variety of heavy objects – small water filled water bottles work a treat as does the bottle the PVA comes in. I should have mentioned earlier that I push copper tubes from a nearby exposed section of baseboard through the Polystyrene to track side. These carry feeder wires that attache at regular intervals to the track. I’m wary the wires may heat up and heat and Polystyrene isn’t a good combination. As they’re only feeder wires they shouldn’t get too hot but carrying them in Copper tubes mitigates the risk of problems. With the track in fixed, the top of the hills are fixed down enclosing the tunnels. These upper heights are then also covered with Modroc and the whole assembly left to settle and all the PVA and wet plaster on the Modroc left to dry for a couple of days. This is probably longer than necessary but as air won’t easily get to the PVA deep inside the hills it takes longer to set. Once all us dry I give the trains a test run, mask off exposed sections of track and spray foundation colours across it all and run the trains over the track one last time. 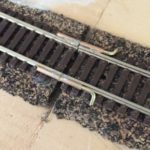 Next up, ballast the track; position some exposed rocks (made from tree bark), add retaining walls in the cuttings and add vegetation and static grass using my ever faithful static grass applicator. > This is an update on my layout. 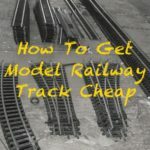 If you found this interesting please share with your railway modelling friends who might also find this and other articles on making a model railway useful.